Legendary Pictures has just finished negotiating the rights for a second American-made Godzilla movie. Twelve years ago, Roland Emmerich's Godzilla remake/reimaging met with scorn from the critics and apathy from movie-goers, and while profitable, did less well than Tri-Star pictures hoped. 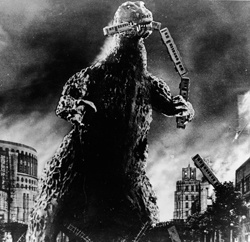 The tepid reception seemed to spell the end of Godzilla's American movie career, but now, Legendary Pictures is stepping up to bat with a new movie, tentatively scheduled for release in 2012. "Godzilla is one of the world's most powerful pop culture icons, and we at Legendary are thrilled to be able to create a modern epic based on this long-loved Toho franchise," said Legendary's Chairman and CEO Thomas Tull, "Our plans are to produce the Godzilla that we, as fans, would want to see. We intend to do justice to those essential elements that have allowed this character to remain as pop culturally relevant for as long as it has." The movie will be co-funded by Warner Brothers via its deal with Legendary, and seems to be being made in close association with Toho. Best of all, Roland Emmerich's name is nowhere near the project, which will make some people very, very happy indeed.